Long time no blog y’all! I would say I was sorry, but I’ve been too busy for that to be true, so I won’t. I just posted a very lengthy comment in response to a podcast I listened to today. Specifically, The Survival Podcast by Jack Spirko. Don’t start your cilantro in the spring if you want to use it in your tomato or tomatillo salsa recipes. Cilantro can take two weeks to sprout, so you’ll want to wait to sow some seed until around 4-5 weeks before you plan on having tomatoes and tomatillos to turn into salsa. Then start some more a week later, and continue weekly succession planting to insure a good supply of only stinky, not vilely reeking cilantro for your recipes. In super hot climates, it may be necessary to grow cilantro in large deep pots indoors. Apparently it’s not as flavorful as cilantro grown outdoors…but to my view, that would be a good thing. Part sun is fine for cilantro…especially if you live in a hot climate. Cilantro would love dappled eastern sun, and heavy western shade…oh, and lots of regular watering. The substitutes are: Vietnamese Cilantro, aka Vietnamese Coriander and Rau Ram – Polygonum odoratum (note: odor). Vietnamese Cilantro doesn’t taste exactly like cilantro…but it’s real close. It is a warm weather tender perennial that’s easily grown. And, Culantro, aka Thorny Cilantro and Stink Weed – Eryngium foetidum (the Latin foetidum meaning stink or bad odor), which is native to Mexico…it is a hot weather tender perennial and grows just dandy in heat. 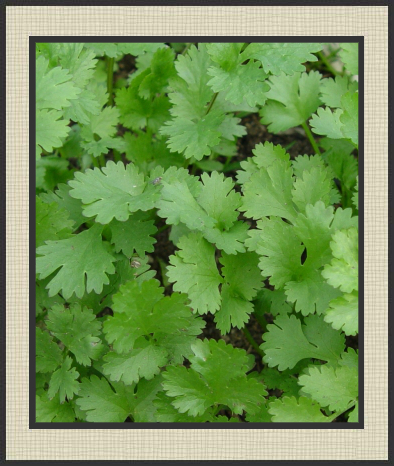 It is said to taste just like cilantro, supposed to be hard to grow, and has medicinal properties. Way back in February and March, I started seeds for plants that require a long growing season and need protection from the danger of frosts like tomato, pepper, and eggplant. Many folks that came to buy plants from me also wanted things like spinach, cucumber, beans, and peas. I had to explain that I only started plants for transplant of those warm season types that needed to be started early to produce a good yield of fruit. Some of what was requested was either far too late or far too early to be set out in the garden, which are the cool season veggies like broccoli, spinach, and peas. The other requested plants, were fast growing summer crops that should be direct seeded like okra, cucumber and green beans. These should be sown now. The key to growing summer vegetables in the Midwest is to look for a fast maturing time. Anything that takes more than 90 days to begin producing fruit should be left for more southern growers. 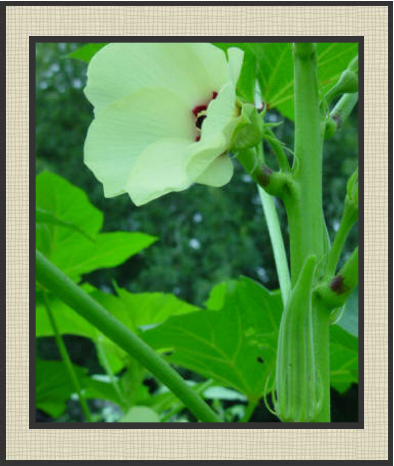 There are lots of cultivators of okra to choose from, all mature rather quickly. They are heat loving and drought resistant. They provide nice summer shade for plants that appreciate a break from the noon day sun…and who doesn’t? 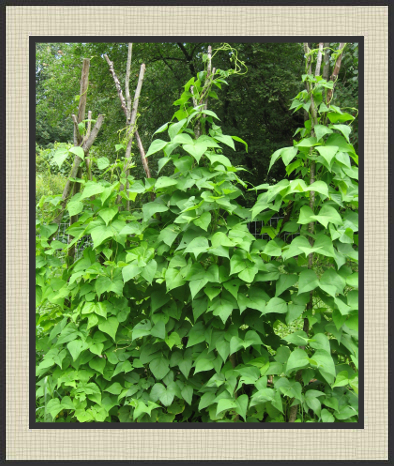 When choosing to grow a member of the legume family, I urge you to grow a pole variety. The bush type are determinate, which means they grow to a certain size, bear fruit and prepare to meet their maker. The pole type seem to continue to grow and produce fruit until the days get short. You will need less horizontal space and fewer plants if you grow pole type. I would advise against growing them in an intensive gardening raised bed arrangement. I believe these would be best grown in a long one foot (or so) wide row, be it a raised bed or something in the ground…curvy or straight. In this way, I bet you could still get away with growing 4 plants per square foot…it’s just that it’s necessary to get to each side for harvesting and that was difficult in the 4X8 foot raised beds I grew them in last year. 50 to 70 days to begin bearing fruit. I had the most success with the Straight Eight of the three varieties I grew last year. They are said to mature in 58 days…I could not keep up with the fruit! Plant only a few vines (I’d say one for every cucumber lover in your family), find out who else you know that loves cucumber too, and pick the fruit every day once it gets just big enough. 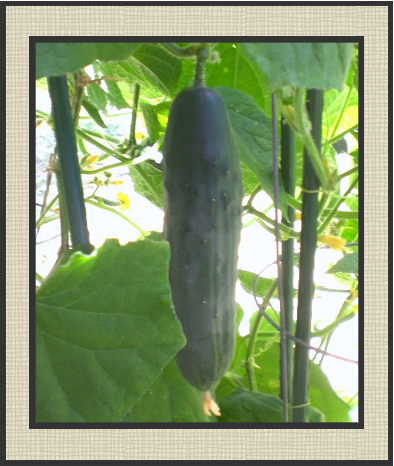 Mature cucumbers have tough skin and huge hard seeds. I found a few early ones. A quick search on the internet should lead you to where you can purchase the seeds of each of the mostly heirloom variety listed below. The Sugar Baby and the Minnesota Midget can be found at just about any retail store that sells seeds around here…and of course there’s always the hybrids. I have read, recently, that cross pollination of squash or pumpkin can cause a foul tasting watermelon. I’ve never heard this before, but I’m certain it would affect the genetics of the seed and create some freak hybrid if you grew the seeds next summer. I have heard true stories of using seeds of pumpkins that were accidentally cross pollinated with squash…the seeds did not make for a tasty pumpkin. To be safe, plant your watermelon as far away from your other gourd type plants as possible. 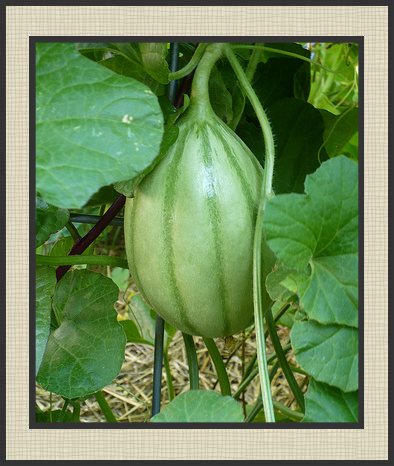 Smaller melons can grow on a trellis. I have also seen Sugar Baby Watermelon and Cantaloupe grown on a trellis. People who do this sling the fruit, or grow it in a net bag like the kind they package onions in. Jenny Lind Melon -70 days. Green Nutmeg Melon – 80 days. Corn takes a lot of space, and is prone to pest infestation (the popcorn varieties – not so much). The sweet kind is nutrient demanding, and there are other things to consider when planting corn. So much so, I could do a two page blog post just on corn. I may well do such a post, but not today. Thanks to Monsanto, most of our corn seed selections has some GMO contamination. I’m not as afraid of the GMO corn as I am the RoundUp that our corn supply is soaked with. My advice is, if you’ve got to have sweet corn, better to grow it yourself. Start with a small 4X4 corn bed and learn from growing this year. Sew a variety that is Sugar Enhanced (SE), not Super Sweet (SH2)…stay tuned to find out why. Just about all summer squash cultivators mature quickly. You’ll find some that take only 45 days to reach maturity, some that take 65 days…and many others that fall somewhere in between. Squash is another type of vine vegetable that grow well on a trellis. Sweet potato, pumpkin, and soybean may also be started now. One quick tip: To speed germination, soak seeds over night. I use one cup filtered water to which I add 1 1/2 teaspoons of 3% hydrogen Peroxide. There are at least three qualities that your vegetable growing soil must possess. 1. Soil must drain well and allow for oxygen to permeate. 2. Soil must hold moisture. 3. Soil must contain nutrients. The first two seem to contradict each other…but if you think of how a sponge works, maybe it will seem a little less contradictive. You basically want your soil to behave like a sponge holding both air and water. For my raised beds, we used a mixture of 1 part peat moss, 1 part coarse sand, and one part compost. The compost I used was ‘composted cow manure’ from Menards. This compost had quite a bit of clay in it…which wasn’t a bad thing, because clay contains lots of minerals. If I had it to do over again, I would have used two different kinds of compost…like the mushroom compost they sell at Home Depot along with the composted cow manure from Menards. Because compost, which was the nutrient component of my soil mix, also helps retain moisture, I would have added more of it to my mix. 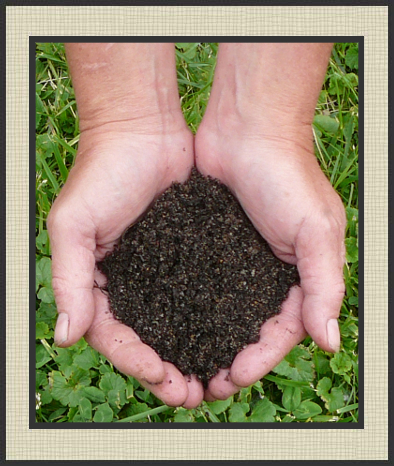 In the future, when I am mixing new soil for raised beds or pots, I will use 2 parts compost, 1 part peat, and 1 part sand. The year before, I used a mixture of 1 part top soil, and 1 part composted cow manure. It made a very heavy soil, one that I would NEVER use in a pot…but it grew absolutely huge bell pepper plants in a raised bed box. I added a little organic fertilizer to the mix for potting up the plants I sold this year. If I could have done that over again, I would have left out the bone meal entirely. The potatoes my son and I planted in the long bed seem to love the bone meal, but the seedlings would have been better off without it. I too could have done without my greenhouse smelling like I buried my enemies in there. YUCK! My advice regarding bone meal is to use sparingly and mix into the soil very well. I found lots of recipes for potting soils on the internet that get specific in regard to ingredients and additives based on what you intend on growing in it. I suppose anything can be complicated if you want it to be. 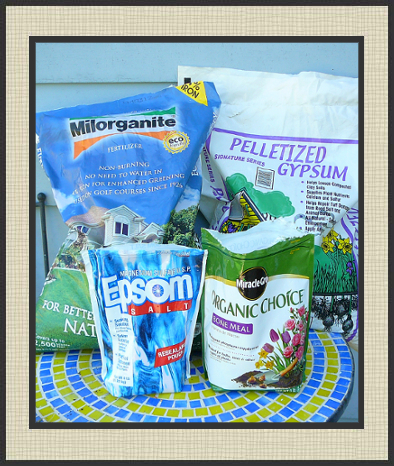 If you just want to make lots of inexpensive soil for a raised bed garden, my mix will work just fine. I urge you to use a 5 gallon bucket to measure, and peat moss fluffs up quite a bit so the 2 cubic foot bale makes a lot more than you’ll think it will. Dump the 5 gallon buckets of each ingredient on a tarp, and use the tarp to mix by pulling the mix over on itself. Lay thin layers of the mix into the bed and water as you go. Peat moss has this way about it…and if you don’t water as you go, you’ll have a heck of a time getting the soil uniformly and completely wet. Soon, I will need soil for my rain gutter grow system . We will be moving before harvest, so mobility will be a factor. Since I need the soil for the grow system bucket to be lighter than what is/was in my raised beds (or my smaller pots that I don’t want to blow over in the wind), I will use vermiculite and/or perlite instead of sand. I’ll keep you posted how all that goes! I’ve been selling lots tomato and pepper plants lately, I feel it’s past time that I post some planting/growing tips for these two plants. Tomato and pepper plants grow best with 8 to 10 hours of sunlight per day. In addition, peppers and tomatoes have trouble setting fruit when temperatures drop too low or get too high. The average hottest part of the day in the USA is between 2 and 6 PM (of course the actual time will vary a bit according to where you live). Your tomato and peppers plants would do well with afternoon shade. The best possible place would be one that gets 100% of the eastern rising sun, and begins getting dappled shade between 12 noon and 3ish. Then gets full shade from 3ish to around 5 PM (at least this is so where I live in Minnesota). The tomato’s optimal temperature range for fruit set is between 65° and 80° F. Tomato fruit becomes small or misshapen if night time temps drop below 55° F, and will set poorly at lows of 50° F or less and highs of 95° F or greater. The sweet pepper’s optimal temperature range for fruit set is between 60° and 80° F, and up to 85° F for most hot peppers. Fruit sets poorly if night time temps drop below 60° F, or are greater than 75° F and pepper plants may suffer bud drop. At daytime temps greater than 90° pollen can become sterile and pepper plants may, again, suffer bud drop. When planting your tomato plant be sure to bury your plant deeply, allowing just the top 4 branches to be above the surface of the soil. I remove all the leaves that would be below the soil line. All members of the night shade family will sprout roots along the stem. This will help your plant develop a large, strong root system that will promote and support growth and fruit production. I have read that you should not bury a pepper plant, but I contend they can be planted just like a tomato. The difference is, most tomatoes grow much bigger than peppers plants and really need the extra roots. If you purchased my pepper plants in the ½ gallon bags…they are already planted deeply enough. One thing that should be done to your pepper plants that needn’t be done to tomatoes is removing the blossoms. You should remove the blossom buds from your pepper plant as soon as you can safely pinch them off without damaging the rest of the plant. Do this until your pepper has been transplanted and has started to grow again (I’ve found this can take up to two weeks), or until night time temperatures stay above 60° F…which ever takes longer. The reason for this is the fact that peppers grow quite slowly, pinching the buds keeps the plant from wasting its energy producing useless flowers and, instead, allows it to use that energy to recover from transplant shock quicker and be bigger when it’s time to start letting it blossom and set fruit. A major problem with the tomato plant is its tendency to develop fungal infections. Taking a few precautions will greatly reduce the risk that your tomato plants will succumb to blight. They are as follows (and apply to other plants susceptible to fungus infections as well): Only water in the morning. Water only at the base of the plant. Be careful not to let water splash up on the plant. Do not use a sprinkler. Do not get the foliage wet. Rain is another issue…and moist stretches in the weather cause lots of problems for tomato plants no matter how careful you are with watering so…. Shake solution constantly while spraying, because the oil needs to stay mixed. I use a pressure sprayer I bought at Menards…two for $8. Spray your tomato plants EVERY single time it rains…Now, there are times when it just rains and rains, for days and days. You can’t spray, and even if you did, you’d be doing it in the rain, and the rain would just wash the concoction into the ground, so you don’t. Then the first sunny day you find your tomato plants are in trouble. This is when you need an actual fungicide…not a preventative. When my plants…any of them, show any sign of fungus I use ORTHO Disease B Gon Copper Fungicide. I follow the instructions except that I also add 1 cup of 3% Hydrogen Peroxide to the gallon of water (more is not better, H2O2 can burn your plants if it’s too concentrated). First, pick ALL of the affected leaves from the plant (it does not matter that you remove most of them…leaves will grow back), put these in the fire pit or throw them in the garbage, DO NOT PUT THEM IN THE COMPOST. Next, wash any instrument used to remove the affected leaves and wash your hands with soap. Then, last, spray the entire plant until it’s completely saturated and dripping. Repeat on other affected plants from the first step to the last until you’re completely finished treating one plant including washing up before moving on to the next. Do this every 7 days or after rain washes away the fungicide until the plant looks healthy again, then you can resume using the preventative. A word to the wise: Go ahead and buy the copper fungicide now. You can get it locally at Ace Hardware. Whether you get your plants from starting seeds or buy plants you need to harden off the plants before putting them in the ground. To do this, slowly expose them to direct sunlight for a few hours gradually increasing their time in the sun each day until they can tolerate a full day of sun. Keep a close eye on them, especially when you are first starting the hardening off process. If your plants begin to show signs of wilting move them to shade. Two weeks of hardening off will condition your plants to sun and wind. Hardening off plants is very important! Many people skip this step and the plants suffer from stress. Stress delays growth, and thus production. Sometimes a non-hardened off plant set out in the garden will actually die. Removing plants from their nursery pots can stress them as well. Make sure your plants are well hydrated before removing them from their pots, and try to move your plants to their permanent place on an over cast day, or in the evening so it can recover from its transplant stress before it has to face the sun.